Local Suicide presents: GO BANG! 13th December 2013 at 11 p.m. 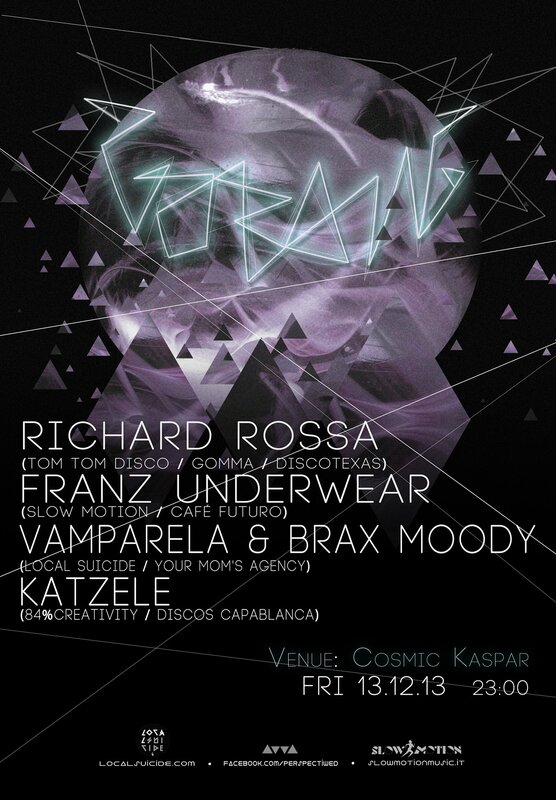 This Friday Local Suicide‘s mastermind and moving power Brax Moody will be celebrating his birthday at one of Berlin’s coolest new locations: Cosmic Kaspar at Rosenthaler Platz (below MEIN HAUS AM SEE). To match the space interior he gathered the cream of the crop: Stockholm based Richard Rossa, who is an extremely talented DJ and producer (with releases on Gomma, Discotexas etc) and the label manager of upcoming nu disco label Tom Tom Disco. Italian all-star Franz Underwear, label manager of one of our favorite labels Slow Motion, amazing producer and super eclectic DJ. The quiet mastermind behind Tel Aviv’s disco-scene Katzele will charm you with his underground selection of finest tunes that you’ve never heard before. And last but not least Local Suicide‘s other half: the Greek Vamparela who’s played her tasty mixture of all genre’s in the last two decades all over the world . As you probably have already realized, this is an event you cannot miss! Entry is 3 € and the fun is guaranteed!